The energy, petrochemical, aerospace and other industries all require materials able to withstand high temperatures. High temperature strength is defined as the resistance of a material to high temperature deformation and fracture. 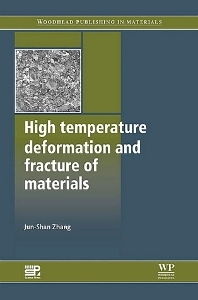 This important book provides a valuable reference to the main theories of high temperature deformation and fracture and the ways they can be used to predict failure and service life. Part 1 High temperature deformation: Creep behaviour of materials; Evolution of dislocation substructures during creep; Dislocation motion at elevated temperatures; Recovery - creep theories of pure metals; Creep of solid solution alloys; Creep of second phase particles strengthened materials; Creep of particulates reinforced composite material; High temperature deformation of intermetallic compounds; Diffusional creep; Superplasticity; Mechanisms of grain boundary sliding; Multiaxial creep models. Part 2 High temperature fracture: Nucleation of creep cavity; Creep embrittlement by segregation of impurities; Diffusional growth of creep cavities; Cavity growth by coupled diffusion and creep; Constrained growth of creep cavities; Nucleation and growth of wedge - type microcracks; Creep crack growth; Creep damage mechanics; Creep damage physics; Prediction of creep rupture life; Creep - fatigue interaction; Prediction of creep - fatigue life; Environmental damage at high temperature. Professor Jun-Shan Zhang works within the School of Materials Science and Engineering at Dalian University of Technology, China.